On the weekend, Fam Fibro headed down to our nation’s capital for a weekend of exhibitions. Previous excursions into the hallowed halls of museums and galleries have had mixed results. Mr10 loves a good exhibition. Mr7 is much more hit-and-miss in this area – he will either be entranced or will bounce from one item to another like he’s in a pinball machine, generally shouting ‘this is BUM!’ along the way. The second response does not put us in good favour with other exhibition patrons, it must be said. This time, we had a 50/50 chance of hitting the sweet spot: two exhibitions over two days. 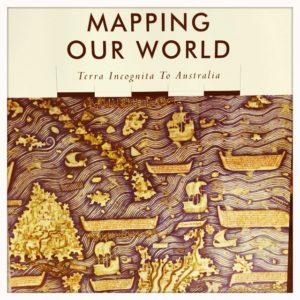 The first was Mapping The World at the National Library and we were there for me: Mummy the Map Tragic. Antique maps are beautiful, awe-inspiring things, full of detail and magic (the boys and I looked closely at each for the requisite ‘mythical sea creature’ – there’s usually one in the earliest maps). For me, those maps are not so much about what’s there, but about what’s not. For Mr7, it was all more about getting OUT of the room as quickly as possible. On Sunday, we rolled up to Gold and the Incas: Lost Worlds of Peru. This one stopped even Mr7 in his tracks. “Is that real gold?” he asked, his eyes little round orbs reflecting in the glass cases (it was really, really dark in there…). Do you take your kids to exhibitions? How does that work out for you?